Forward: It's been over four years now and this is the first time I've written of Argentina outside my private journal. The trip was such a turbulent experience for my heart, soul, and mind. It pushed me to confront the walls of my insecurities as well as evolve my view of the world. It's due time to give this experience air. Esquel, Argentina. February 16, 2011. With a wave goodbye and well wishes, Pachu steers the truck back onto the road. We are left standing on the side of the highway in the growing heat of the morning.The thought crosses my mind to just walk back to town and camp. But then what? Our ride back to the house we are staying at won't be arriving for at least 10 days from now. We begin walking. "Hitchhiking will be no problem," we've been told. Its a regular form of travel still in South America and having a female with you always increases your chances. We are delightfully surprised when a truck pulls over within 30 minutes. A big guy wearing a pink polo that reminds me of a rapper jumps out of the pickup to help us with our bags. He is accompanied by an old gaucho and a boy of somewhere around 15. No one speaks English but they are friendly and try nonetheless and help us in translating our broken Spanish. An hour and a half later, they drop us at our destination: El Bolsón. It is a charming little mountain town tucked at the base of its surrounding peaks. It is known for being a crossroads of sorts, attracting backpackers, vagabonds, and day-trippers from all walks of life. Our arrival is greeted by the street market in full swing. Handmade crafts and food stands are everywhere and fresh produce is abundant (This area has what's known as a micro-climate, providing the ideal environment for produce to thrive. Some of the best fruits and vegetables I've tasted in my life were from here. Though, perhaps my judgement was jaded by the overwhelming Argentine diet of meats, cheeses, breads, and dulce de leche. But lets assume the former). 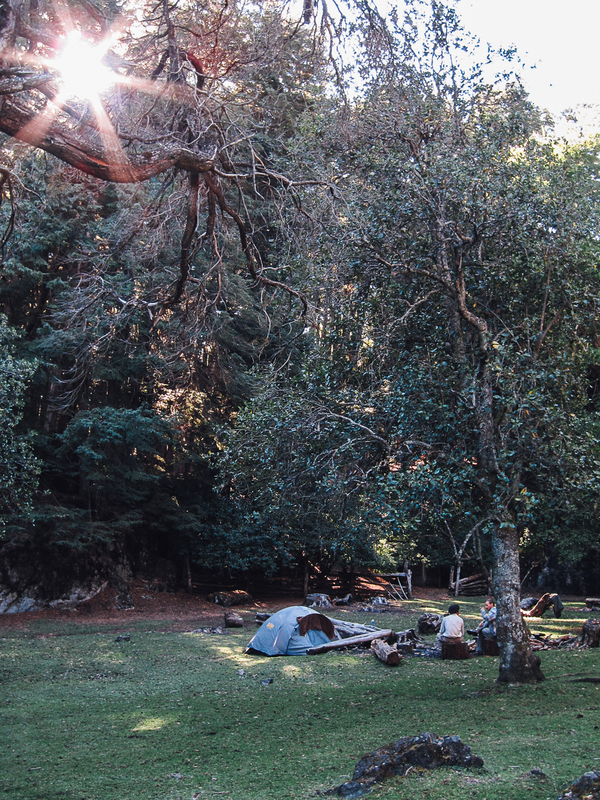 We spend the next two nights in town, enjoying the amenities, mingling with other travelers crossing through, mending our janky tent with packaging tape (Argentina has yet to discover duct tape) and preparing for our coming trek into the mountains to the Cajon del Azul. We set out early with an espresso at a quick mart. There is a bus that can take us to the trailhead but for the distance (approximately 6 miles) versus the expense of a ticket we opt for walking. With the heat of the day bearing down quicker than anticipated, we soon decide to try our luck at hitchhike again. It's unlikely someone will take us all the way to a random location but any distance can help. We receive a ride from Russian looking man that takes us a couple miles down the dirt road that leads to the the trail. I remember him being a jolly man and getting a kick out of Ben's attempt at small talk through his patchy Spanish. We have more miles to walk and we are no longer in an area of regular passing cars. Just dirt road lies ahead. I must add that walking along a dirt road for hours has one major pitfall: dust. Oh, the dust. When you are walking on the side of a very hot, dry dirt road, every passing vehicle stirs a haze of dirt into the air that you have to continue to pass through for the next five minutes. It creeps into every crevice and pore of your clothes, pack, and body and slowly turns your hair to a nest of dreadlocks. My pants that I wore that day still smell of the dust from that trip, no matter how many washes they have been through. In a way, they have preserved a memory within their seams. Also, never wear a white shirt. We finally reach the trailhead which provides us a sense of fresh energy. On long hikes like this my mind fools it self by these major breaking points, subconsciously thinking we don't have much further to go. It's helpful for the renewal of energy but certainly creates for an awful lot of letdowns. Through the first couple miles of the trail there are many people and even a small walk-in-only restaurant along a river. We cross multiple suspension bridges of questionable quality that allow for the back and forth passage over the winding river. The landscape evolves as we progress and there are less frequent passings of other hikers. 12 miles, 7 hours of walking along highway to dirt road to trail. We scaled rocks and climbed thousands of feet in altitude. The land began to open to a small valley. We crossed a bridge that exposed the steep walls of a river canyon below us. The water running through those walls was as blue as the sky above. We walked along a wooden fence that surrounded pastures and open fields. Our trail led us to a welcoming latch gate at the center of the fencing. Beyond the gate the trail, lined with cherry trees, widened and softened as it became grass and led up to a large house just off in the distance. We were completely surrounded by jagged, snowcapped peaks that stunned us at their magnitude but yet felt reachable. It may have been exhaustion, but it felt as though we had walked into a piece of heaven. This place was a magical eden. The house was a shelter of many forms; a refuge, a hostel, campground, restaurant, garden, horse corral, store, home. The proprietor of the grounds was a family that had retreated to the mountains from Buenos Aires 30 years ago. They ran the refuge through the summer and fall open to travelers. But as winter approached they closed up and hunkered down as the snowpack became too deep to leave. We sprawled out on the grass immediately upon our arrival. Packs were removed and shoes that left perfect outlines of dirt on our feet were pried off. A moment of pure bliss. 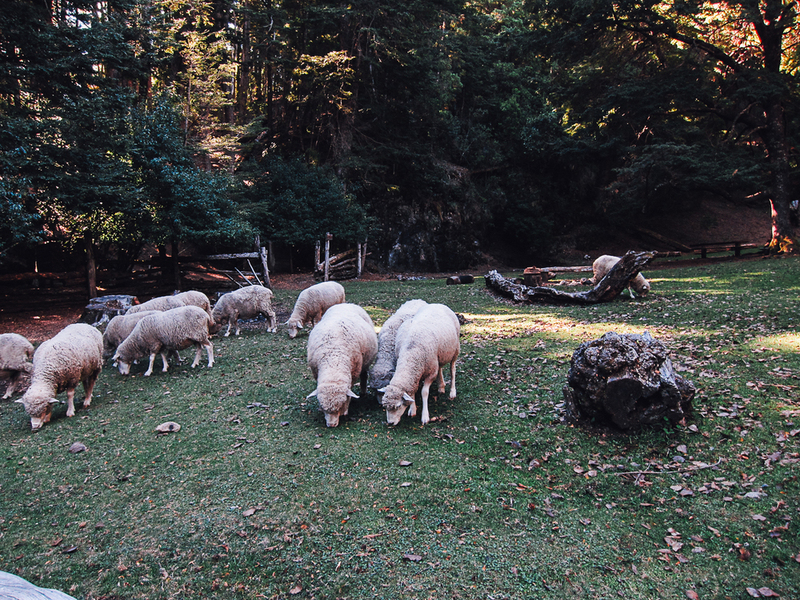 We stayed for two nights among the grassy hills where sheep and horses roamed freely. We ate house made pizza, shared mate with other campers and explored the river and marveled in its falls and winding caverns, projecting a color comparable to the waters of the Mediterranean. We rested and recovered in this wonderous space and found ourselves filled with an overwhelming sense of gratitude. On our last night, the skies were clear and the moon was full. You could see it rising behind the peaks, silhouetting them in its magnificent luminescence. The Argentines refer to this phenomenon as "ducha luna" or moon shower. That night we walked down the path under the branches of the cherry trees. We were unfazed by the night because the moon allowed for such clear visibility. The air was warm, still containing the qualities of mid summer. We crossed the bridge and laid down on the rocks above the river to gaze at the stars, to listen to the moving water, while bathing in the light of the moon as the warm breeze brushed our faces. We were 6,530 miles from our home and many trials still lay ahead. The following few days were to be some of our most challenging yet. But in those moments there in moonlight below the mountain peaks, our hearts felt in perfect harmony with the world. The worries of yesterdays and tomorrows irrelevant. Right now, right then, was peace.